What Content Marketing Appeals to Customers? You are here: Home / Blog / What Content Marketing Appeals to Customers? What Brings Them Back? Keep customers coming back. Understand the buying journey. Map your content marketing to it. Customers hunger for content that’s relevant, credible and clear. 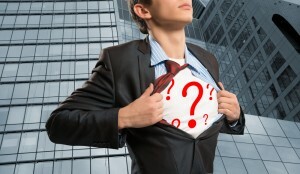 Ensure relevance by basing content on real customer questions. Canvas sales, telemarketing, customer service, your website, news and trade media, social media and other sources to collect customer questions. Scoop up questions that customers raise in retail stores, satisfaction surveys, focus groups and other research. Listen for questions when you see customers face-to-face – for B2Bs, in demo rooms and customer meetings, and at trade shows and events. Compile all your customers’ questions into a giant list. It’s the first thing I’d prompt you because the payoff can be immense. Now, it’s time to mine for content marketing gold! Especially for high ticket and carefully considered B2B purchases, it’s crucial to map the questions to the 4 steps in customers’ buying journey. Here’s a model of the buyers’ journey. Many customer questions most resemble these; tag them as step 1 questions. 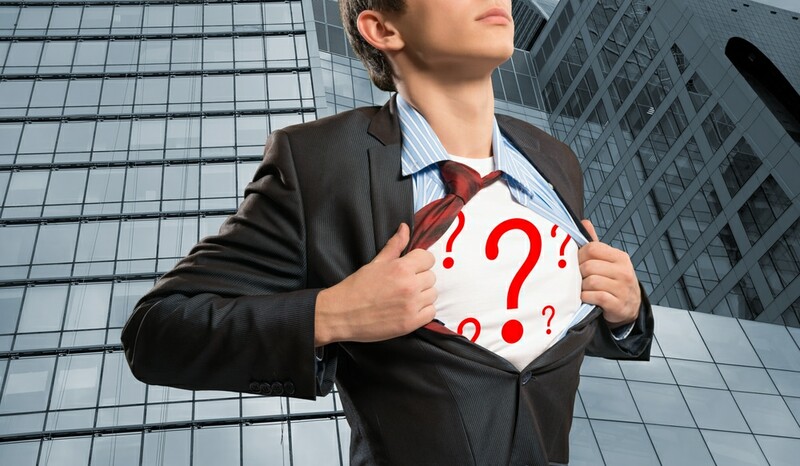 Now, formulate answers that help magnify the problem in customers’ eyes to prompt action. Show how big the problem is today and how much it will grow over the years. Calculate what the problem costs, including the hidden costs such as wasted time and money. Dramatize the consequences of not addressing the problem. Paint pictures. Tell stories. Connect fixing the problem with improving key performance indicators (KPIs). Reveal the benefits of addressing the problem now vs. later. When possible, tell customers something they don’t know about a problem or opportunity they don’t yet see. That positions you as a guru or guide customers can come back to. Prove that maintaining the status quo is a lousy option. Which product or service performs better? What’s the right way to compare performance? How should we compare price and value – based on first price or lifetime value? What really makes the difference between available options? Tag similar questions as step 2. In developing answers, focus on differentiating your product or service. Make it easy for buyers to compare alternatives side by side. If you don’t, they go to Google and you miss up to half the revenue opportunities. Bring back buyers again in step 3. Now it’s time for customers to resolve concerns and verify your claims. They seek third-party verification through customer case histories, testimonials, news media, social media, and analysts. Customer questions that seek to verify fit into step 3. In step 4, buyers make a purchase. Customers still need content marketing, but now their questions turn to how best to put the purchase into operation and optimize it. Most customer service questions fit into step 4. Offer your customers a full set of questions and answers to address all 4 steps. This kind of content appeals to customers, addresses their needs, and keeps them coming back for more. Note: You may not need to be so precise on lower-dollar purchases. But in high-ticket, consumer and B2B content marketing, forming this discipline really pays off in revenue conversion. Build credibility. Help customers before you sell. Answer all their questions first. When you try to sell too soon, you scare customers away. Understand customers’ problems and help them out – before you try to sell. If you provide content that actually addresses customers and their needs, it puts you ahead of 80% of BtoB websites. Be clear. American attention spans have shrunk to 8 seconds. Your content needs to make a point that quick. That’s what it takes to break through the clutter and capture attention. 20 minutes and up: White paper, case history, webinar, demo, speech, trade show, event. Always speak your customers’ language. Don’t talk over their heads. Make sure your content is understandable to the technical buyers, economic buyers, operational buyers and others you serve. It’s ok to use jargon that’s industry standard and clearly understood. But it’s not ok to use jargon that’s confusing. Confused customers don’t write checks. More readable text means more people who can understand in the United States and in other countries. Ensure high readability. Reach a larger set of buyers by writing at a lower grade level. In light of U.S. literacy levels, that’s key. It’s critical for global businesses, whose customers speak English as a second language. 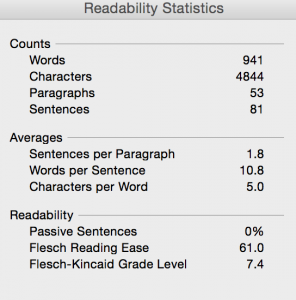 As you write content, use the readability statistics built into Microsoft Word. Full disclosure: the chart to the right shows how this blog measures up on readability.